what are your thoughts on this? a reasonable repair attempt? assuming they tested the glow plugs and they were fine this time .. I would say to them that you want to try a cold start when you pick it up. 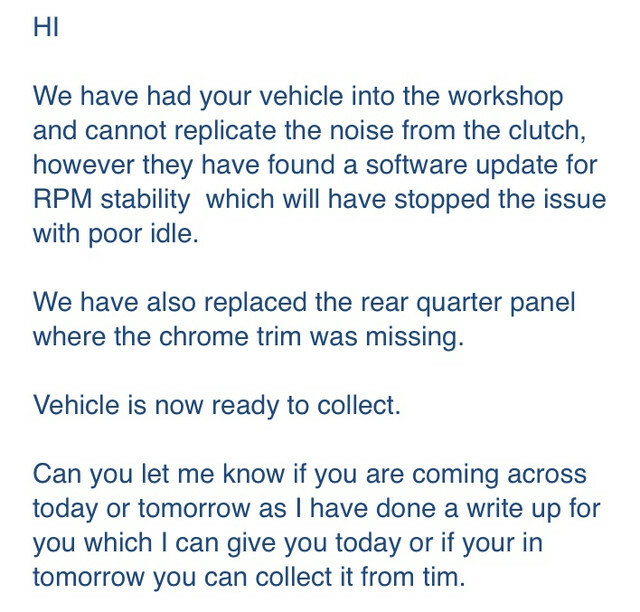 For starters, excuse the pun..
Have a good look at the trim repair to make sure it's tidy and secure and ask them to document the clutch noise issue in case it gets worse. Absolutely! although chances are it’ll be fine with them and go wrong tomorrow! the wonders of an intermittent issue! Yeah. Intermittent are the worst! Still a little suspect that the glow plugs were faulty first time around and now they think it’s something else? could an incorrectly configured ECU have affected the GPs? could an incorrectly configured ECU have affected the GPs? The ECU controls everything to do with engine management so many areas can be affected. Mate, I would forget about GPs, you keep barking up the wrong tree. Do a bit of reading !! They are there to achieve a cold start, they can be reapplied by the ECU in certain circumstances to enhance emissions. Once your motor is running for 30 seconds, GP task is over. In my warm region, I can cold start a car without them. In any case .. the software update has been done and I’ve got the car back. Will update with any developments. "[GPs] were ... faulty... and replaced symptoms haven’t changed "
Which demonstrates that GPs do not radically affect the car's performance. In simple terms, you had an engine management fault and ALSO 3 faulty glow plugs. You now have an engine management fault . And yet, replacing the glow plugs had significant effect on the SEVERITY of the symptoms. Odd. And yet, replacing t"[GPs] were ... faulty... and replaced symptoms haven’t changed "
@Cap2018 , with respect mate, never go to Court. Your story is changing and frankly I must defend your mechanic. Now you say , the glow plugs had significant effect on the SEVERITY of the symptoms. As an advocate for your mechanic I would suggest that there were two separate faults. One was professionally repaired the other has yet to be diagnosed; and you refuse to acknowledge that fact. Feel free to reread the thread, mate. GPs were replaced but never once did I say that I believe the idle is fully cured. I have maintained that there is at the very least a subtle pulsing on cold starts throughout this entire thread. The symptoms haven't changed, the severity of the symptoms has. I don't understand your confusion? Still getting RPM bouncing, still on cold starts and still lasting 20-30 seconds. Less severe fluctuations but fluctuations none-the-less. You may well be right and these may be 2 separate issues but given the current situation, I believe that to be a little unlikely. I appreciate the assistance that you and others have provided on this forum but, with respect, don't appreciate you patronising me. Sorry but I am not the mechanic on this job, I am 1000s of miles away. I can only rely upon your hopefully concise and un-emotive information, to which I respond in kind,. Everyone here was blaming GP for the cold start RPM fluctuations. I have the question: Did you or mechanics checked fuel pressure withing this 30s from start? It sounds like fuel delivery issue, maybe caused by software fault (like your garage stated). hi my old friend Thankyou for your rational suggestion, you could well be on the money. To do that test they have a very short window of opportunity, perhaps better to use a data logger if it is available. The GP problem is done and dusted. The lack of smoke indicated that they were not causing any major problem, even though only one was working. However, without any mechanical wisdom, Cap2018 has solidly wedged the GP problem in his mind along with imagined repercussions in the future. All this is irrespective of his mechanics and our assertions to the contrary. I have put up with this BS for 3 pages only now to be called "patronising'. If his mechanics are copping the same treatment, he has little chance of gaining their cooperation. I have to put with this sort of thigs on daily basis - scientific equipment engineer. How many times I have heard - I did not do it, or I already tried this and did not worked. Always after my sugestion that this will cost 2k, or over, then I finally get to the truth, what actually was done to equipment. You have to grow thick skin, thats all. It is frustrating, especially that you try to help. Some people forget, that we do not have x-ray vision, or we are not mind readers. Sorry chaps, CAP2018 has left the building. I bet his dealer dreams of having the same release. Not an ideal outcome in my opinion. I appreciate your help very much Gary, but if members choose not to go with it verbatim then they shouldn't be made to feel uncomfortable. Just saying.